These owners drew on experience to redesign their new home in West County. Open to the foyer, the mirror-walled dining room features an inlaid, rough-hewn table, bench seating combined with metal-trimmed dining chairs, and a transitional chrome-and-crystal chandelier. Opposite the dining room, the upper level of the living area is furnished in a neutral palette of gray and white that emphasizes the dark-stained architectural elements. 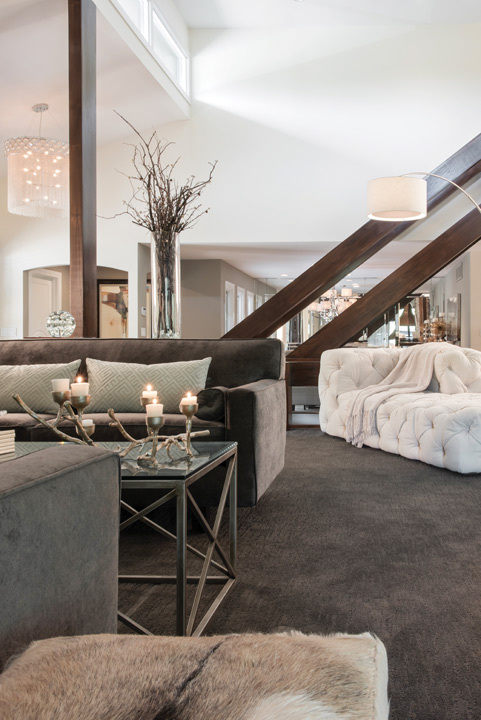 For texture, the owner chose a tufted white sofa and furry hassocks. 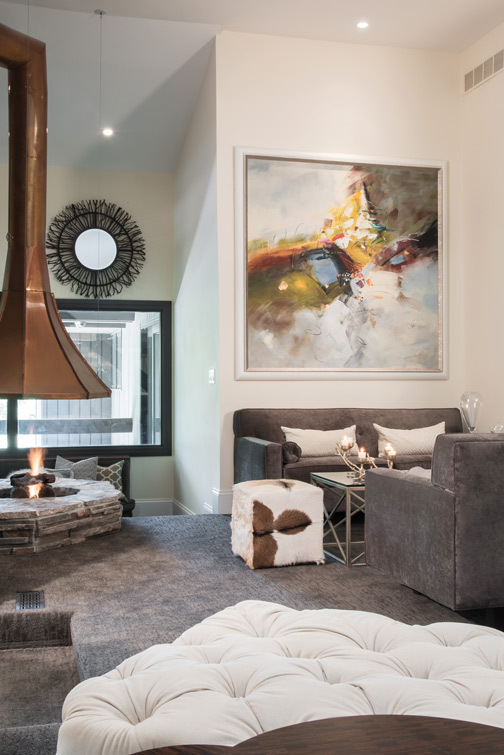 An oversize abstract establishes the focal point on the living area’s upper level, and defining the step-down to the lower level is a dramatic indoor fire pit with copper hood. Floor-to-ceiling windows fill the newly added hearth room with natural light. Completely renovated, the kitchen is centered by a huge island, topped with a rare natural stone quartz in an antique honed finish. Custom cherry cabinetry, iridescent tile backsplashes, and stainless JennAir appliances line the walls. Creating an attractive transition from the kitchen’s 8-foot ceiling to the 10-foot ceiling in the new hearth room, the soffit was gently curved and the curve duplicated by the stone-faced peninsula separating the two spaces. A colorful reflection of her many interests, the daughter’s bedroom showcases a crown with draped silk muslin accenting the poster bed, several of her own artworks and sheer curtains lining the shuttered windows. 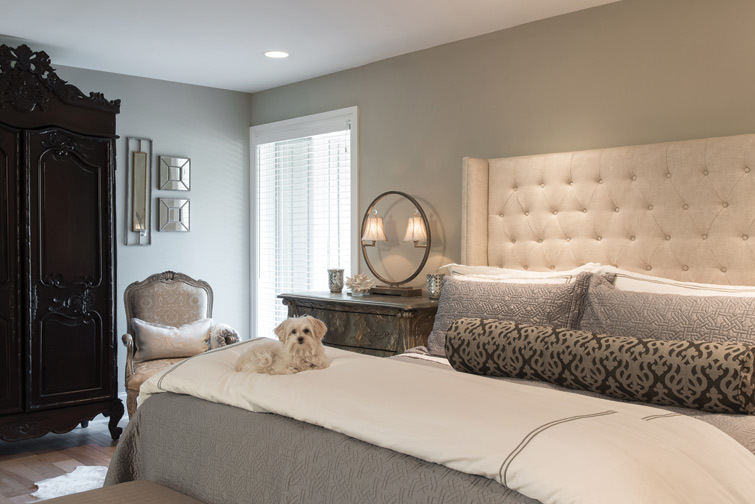 Kaycee, the family’s Havapoo, lounges in the master bedroom, which repeats the home’s neutral color scheme and “urban transitional” styling. Among the tasteful blend of furnishings are a massive highboy, traditional damask chairs, a Bombay chest and a cowhide rug. Longtime residents of Chesterfield, this couple loved their fashionable neighborhood and the many friends they’d made, but were ready for a newer, more contemporary home. They’d often admired a nearby 1.5-story set on 2.25 acres, and when it became available, they made their move. Built in the mid-'70s, the residence had a unique main-floor layout, but the upstairs bedrooms were tiny, the kitchen rather small and the décor typical of its era. The new owners could see the home’s potential and combined their talents to create the warm, “rustic urban” styling they’d envisioned. Having studied architecture, the husband developed the concept for expanding the living space by 2,500 square feet, and the wife applied her flair for design to the interior and exterior components. “Everything was gutted and remodeled,” she recalls, noting that the first major step was digging a deeper foundation for the three-story addition planned at the rear of the home. Among the primary structural objectives were larger bedrooms and baths, expansion of the kitchen and addition of a hearth room and spacious outdoor entertainment area. 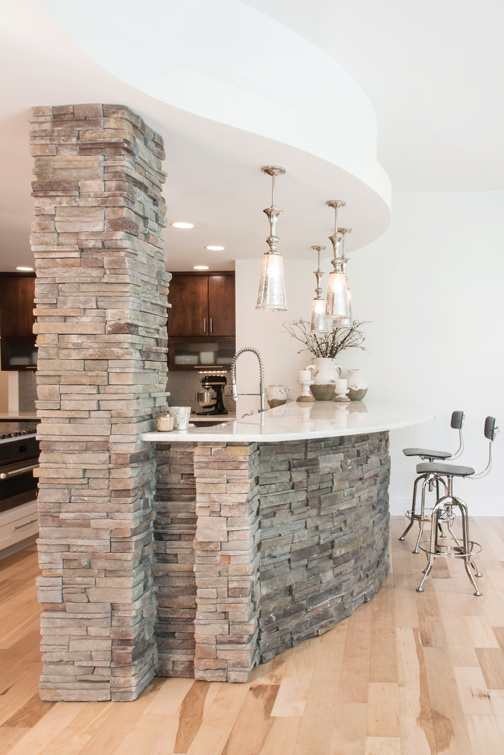 Inside and out, stacked stone was used to create the desired rustic effect; two more HVAC units and all-new lighting were installed; and much of the flooring was replaced with wide-plank natural birch from Countryside Flooring America. In the foyer, a closet was removed to open the space, and the main staircase, formerly oak, was dark-stained and fitted with glass panels on the upper level to dramatize the entry area. Open to the foyer, one wall of the formal dining room was already mirrored, but the wife overlaid it with beveled mirrors for visual interest. To make the space “more casual,” she chose an inlaid, rough-hewn table and transitional sideboard from Shubert, bench seating from Expressions coupled with stylish metal-trimmed dining chairs and a chrome chandelier with crystal drops. Opposite the dining room, the open, bi-level living area was original to the floor plan and ideal for entertaining. 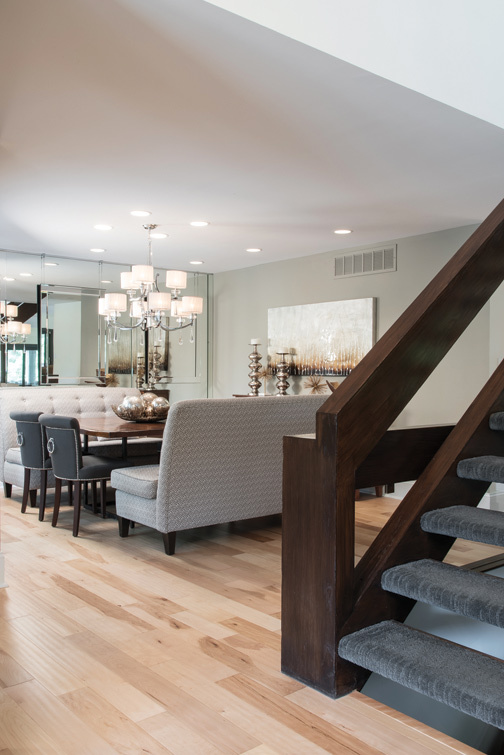 The step-down arrangement creates two sizable gathering spaces, allowing guests to congregate wherever they’d prefer. The new owners, however, decided to accentuate the layout by installing a stacked-stone indoor fire pit, visible from both levels and fitted with a stunning copper hood. Tastefully furnished in gray and white, the upper level’s focal point is a large, vivid abstract, and the generous seating includes a white tufted sofa from Restoration Hardware; charcoal velvet sofas facing a contemporary Plexiglas-and-metal coffee table from Crate & Barrel; and a variety of stylish hassocks. Overlooking the deck and pool area, the lower level has an angled fireplace and is somewhat more casually furnished with additional seating, cowhide rugs, sofa tables in glass and aged brass, and tucked into one corner, an ultra-tall high back chair from Arhaus. Remodeling the kitchen presented a major structural issue, and a clever design strategy was used to transition from the kitchen’s original 8-foot ceiling to the 10-foot ceiling in the newly added hearth room. To compensate for the difference in height, the kitchen soffit was gently curved and, directly below, the curve is repeated in the overhang of the stone-faced peninsula that separates the two spaces. Centering the kitchen is a huge 6’ x 10’ island, topped with a rare natural stone quartz in an antique honed finish. 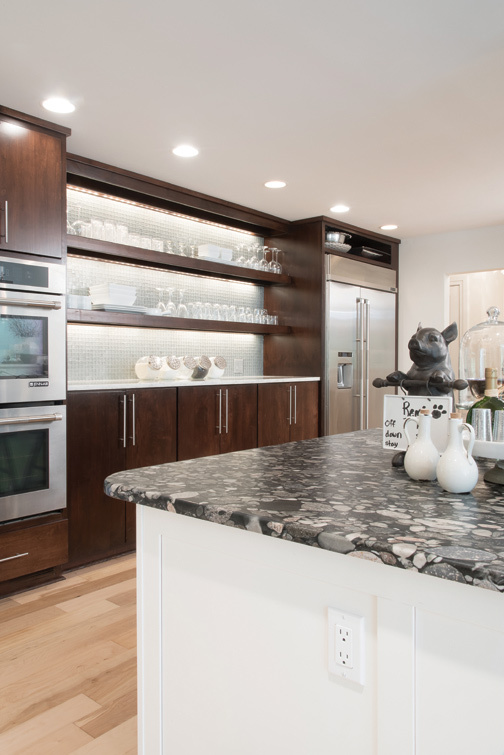 Sleek cherry cabinetry lines the walls, and the stainless Jenn-Air appliances and range hood are complemented by contemporary stainless bar pulls, granite quartz countertops and iridescent tile backsplashes. Saluting a favorite West County eatery, the owners added a casual dining nook, reminiscent of Annie Gunn’s with its coffee-hued paneling and round Shubert pedestal table. Lit by floor-to-ceiling windows, the vast hearth room virtually merges with the home’s fabulous outdoor entertainment area, and natural materials further emphasize the indoor/outdoor atmosphere of the space. The room’s capacious ecru leather sectional encircles a gleaming, freeform acacia root coffee table and, sourced from Restoration Hardware, handsomely contoured Copenhagen swivel chairs in cowhide provide additional seating. Beyond the windows, the deck was extended for access to the pool area, but the owners preserved the views by inserting glass panels into the stained cedar railing. And the views are spectacular! Landscaped by Baxter Gardens, the rear yard is a warm-weather oasis, highlighted with a stunning contemporary fire pit and large semi-circular gathering area. Designed by Pool Specialists, the swim area enhances the visual and architectural effect with water bowls, set on stacked-stone pillars, spilling into the pool. Moving to the family privacy areas, the main-floor master bedroom reinforces the home’s neutral color scheme and “urban transitional” styling with an interesting variety of furnishings and textures. Sourced from Restoration Hardware, the ecru headboard is tufted. Upholstered in light gray velvet, the chaise is combined with traditional damask chairs from Décor; a massive highboy from Three French Hens; a mirrored Bombay chest that serves as a bedside table; a cowhide area rug; and a Plunkett bureau, refinished in gray by the wife to give it an “aged” look. In fact, the spacious, tray-ceilinged bedroom is a colorful expression of the daughter’s multi-faceted personality, mixing a few familiar pieces from the owners’ previous home with new acquisitions. The Shubert poster bed was painted white, topped with a crown, and draped with silk muslin. 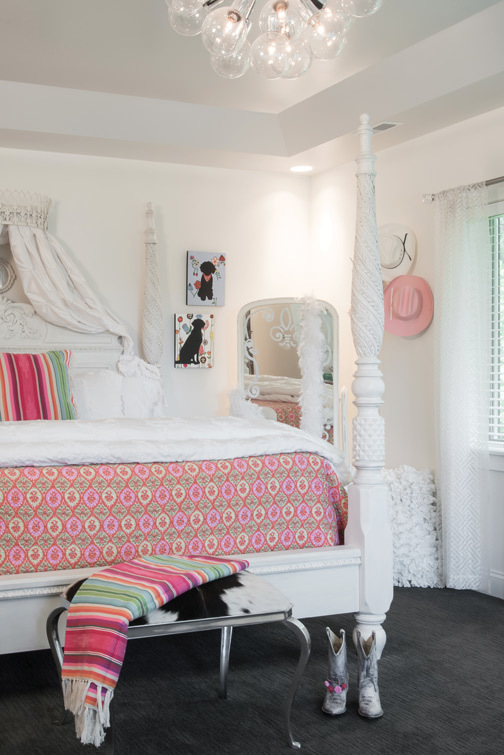 The window treatments are white sheers in a key motif; the walls are covered with the girl’s own artwork; and prominently displayed is a cowgirl/horse pillow she made herself.